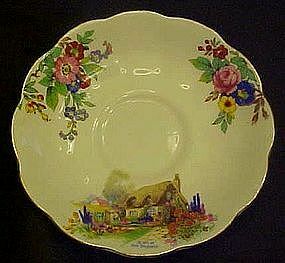 Pretty bone china saucer with sprays of flowers and an english cottage garden scene. Not sure if this is one of the cottage garden series. Below the cottage it says "A bit of old England" It measures 5 5/8 in diameter and has a nice scalloped edge with gold trim. Hopefully you have the lovely cup that matches this saucer. Pristine condition.